Our mission, at the winery in late spring and early summer is to bottle, bottle, bottle so we can make room for our 2012 harvest. First we bottle the white wines from last year’s harvest. This year we began bottling as early as February, then a bit more in April, and almost all the rest in May. In June, we began bottling our 2010 reds. So lately we’ve been busy assembling our blends and making any necessary adjustments to fine-tune the wines. We do all this while fending off the ubiquitous barrel salesmen that appear from all directions. The vineyard is looking very pretty now, flush with this year’s new growth. The vines have just gone through a second round of shoot and bunch thinning, and suckering. We do this to eliminate any unproductive growth that would sap the vines of the strength they need to produce a healthy, robust crop. At the same time we are removing extra shoots and clusters to balance the vines in terms of canopy and fruit production. 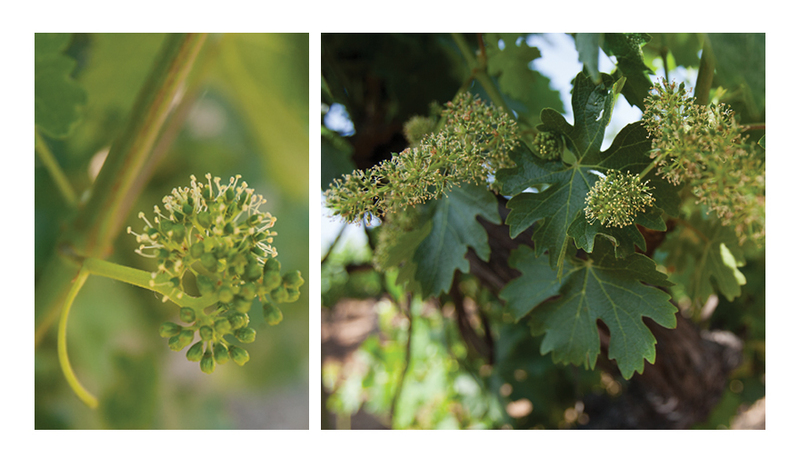 The vines are at the stage where the green clusters open up and reveal their light yellow flowers. Soon after bloom will come berry set. While all looks good at the moment, a sudden change in the weather could result in a poor berry set which would lead to a smaller crop. We are diligently and continuously keeping an eye on the vines to ensure they are safe from pests and diseases. We’ve treated the vines to repel the glassy winged sharpshooter, and have sprayed the vines to prevent powdery mildew. Nature has the final say as to the quality of this year’s harvest, but from now until the grapes are ready to pick in the fall, we will do our part to ensure the best quality possible. This entry was posted in Wine Musings and tagged nature, plants, restaurants, travel, vacation. Bookmark the permalink.